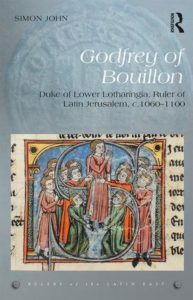 Godfrey of Bouillon, who rose to be leader of the First Crusade, died shortly after the conquest of Jerusalem leaving behind the newly founded Latin holdings in the Holy Land, and a reputation which quickly shrouded his figure in myth. Simon John’s new biography, the second offering of Routledge’s Rulers of the Latin East series, reviews existing scholarship and primary sources about him to create a new, highly competent and insightful biography of Godfrey. While Godfrey’s years on campaign in the East and as ruler of Jerusalem have been object of countless discussions in crusader literature, John’s approach is to place Godfrey in the context of his rule of Lotharingia, and in the complex web of kin relations and conflicting political interests which shaped his early life.